In what’s become a trend for the series, the first information on the upcoming NBA 2K games centers on its set of franchise modes. It’s leading with a strength, albeit one that isn’t always seen as the most marketable aspect of sports games. Today 2K Sports revealed the details on MyLeague and MyGM for NBA 2K19 and as fans have become accustomed to, it’s a wealth of new features and added depth that are unmatched in the genre. 2K19 will finally include a true online franchise as MyLeague Online will include almost all the same elements as when the mode is played offline, MyGM will offer both the narrative version that debuted last year and the more traditional MyGM to choose from, new sets of sliders have been added to increase customization options even further, and that’s just a few of the items that have been detailed. ♦Since this IS MyLEAGUE, customization is the name of the game. Admins can create ‘Custom’ timers for their league advancement that allow you to have some events be live, fast-paced events, and others a little slower and methodical. The team here really thought through HOW people will be playing this mode, and thus provided as many options as possible to cater to every type of player out there! As you might guess, we have also given League Admins the ability to pause the progress of any and all timers any time they wish. Sometimes real life happens. On the same token, Admins can also advance past timers and move things along quicker should the need arise. The system is very flexible. ♦The top portion of the panel lists all of the members in the league and their current online status (this is incredibly helpful when trying to coordinate your games against other league members!). Additionally, this portion of the panel is also used heavily in the offseason as a ‘Ready-Up’ indicator. This tells other members of the league when you have finished and are ready to advance to the next offseason time period. When all members of the league are officially ‘Ready’, the league will advance, even if there is time left on the timer. There are other ways you can customize your ‘Ready’ timer (e.g. such as setting it up to auto-advance you through the remainder of the offseason). When I said earlier that the team really thought through how people will play through this experience, this is one example of that. Usability is key. ♦Another area of the panel is the ‘Notifications’ area. In previous years, you could really only access this from the Calendar menu. Now, whenever you receive a trade offer, or invite, or league notification, you can quickly and easily access it from anywhere! ♦The final area of the panel is the ‘Deadlines’ section. While useful during the regular season when it comes to things like the trading deadline, this really shines in the offseason as it gives you a full run-down of all the deadlines for each upcoming time period of the offseason, so you can plan accordingly. With your player still selected, you can manipulate the ‘Team Style Importance’ slider. This will adjust the perceived value of the player by the evaluating team based on how much value they put on the player’s fit to their style. ♦The discount on trade value for ‘Draft & Stash’ players (think of them like future players, like draft picks). ♦How much of a premium on trade value teams will add for players who were recently signed by them. ♦How much of a premium on trade value teams will add for players on their untouchables list (lower this value for more high-end player movement). As I mentioned above, you can adjust how much draft picks are valued by each team state. You can also adjust a slider for each of the four team states that allows you to set their Draft Pick Importance, or rather, how much that type of team values picks (future players) relative to players already in the league. ♦The first set of sliders here allow you to either raise or lower both the Expected and True salary. I’ve heard a number of comments over the years that certain types of players sign for too much (or too little) in Free Agency. Do you think low rated players sign too cheap? Do you think fringe All-Star players ask for too much money? This is your chance to customize all of that to your liking! Next up, you can adjust the importance a young player’s potential factors into their worth. You can then adjust the importance of a player’s durability and how that affects their worth. There is even a slider that allows you to adjust the importance of minutes played in the previous season for a player’s worth when signing a new contract. This is one that I personally enjoy tweaking and playing with. As with trade value above, you can fully adjust the importance of fame/name recognition for a given player’s worth. Another important slider I like to tweak is the ‘Player Non-Financial Ambitions’ slider. This adjusts the importance of player role and team success in contract negotiations, allowing you to emphasize (or deemphasize) how much a player values ‘fit’ versus getting the best payday possible. 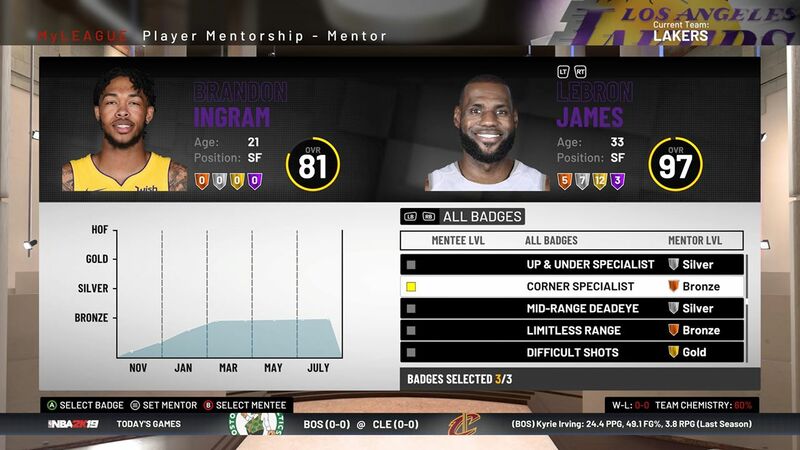 ♦First and foremost, you can manipulate the ‘Training Effects’ slider, which adjusts how quickly players progress when using the In-Season Training feature. ♦Next, you now have control over how quickly players progress during the season at each of the available training intensity levels (Rest, Very Low, Low, Medium, High, Very High). ♦Moving on, you can now control how quickly players progress during the season with respect to their Work Ethic (Medium, High, Very High). If you think players with a Very High Work Ethic aren’t getting the gains you would expect, tweak and tune this slider to your heart’s content. ♦Fully customize the shape, size, and prominence of the Brow. ♦Select and colorize the Eyebrows from a library of choices. ♦Fully customize the Eyes by selecting their color and controlling every aspect of the eye and eyelids with six sculpting sliders. ♦Fully customize the shape, size, angle, and rotation of the Ears. ♦Fully customize the position, width, and prominence of the Nose with six unique sculpting sliders. ♦Fully customize the shape and size of the Cheeks. ♦Fully customize the Mouth along with the thickness and prominence of the Lips with a host of available sculpting sliders. ♦Select and colorize Facial Hair from 50 unique choices. ♦Fully customize the width and prominence of the Chin with a set of five unique sculpting sliders. ♦Fully customize Skin Color from a library of choices, while also maintaining control over Blemishes, Discolorations, Freckles, and Pock Marks. ♦And finally, FULLY customize the style and color of the Hair. Many hairstyles also allow for the customization of the length of the hair (very cool), the pattern shaved into the hair (think lines, Jumpman logos, etc. ), control over the fade, and even how you shape the hair corner on the back of the neck (are you a round or a sharp corner kind of person?). ♦Easy – A casual and relaxing experience that casual players can jump right in and enjoy. If this is your first foray into MyGM, this is a great starting point! ♦Medium – A realistic experience that slots in right around the difficulty level of past MyGM. ♦Hard – A challenging experience that will put your GMing abilities to the test. I would only recommend this level to the true MyGM fans out there! ♦Custom – Customize the sliders to your heart’s content to mix and match difficulty settings and sliders to create your very own MyGM experience. Additionally, we now also offer a proper Rising Stars game as part of our All-Star Weekend. A game intended to showcase the young talent of the league, the format will follow the NBA’s lead with Team USA competing against Team World. The first rule change I want to talk about is quite simple. When enabled, 8 teams will still make the playoffs from each conference, however, all 16 teams that make it are ultimately seeded 1 to 16. Yes, this means you can have foes from opposite conferences squaring off in the first round of the playoffs and rivals from the same conference meeting in the NBA Finals. There has been so much discussion in the media about how we can ‘save’ the playoffs format with all the talent moving West.